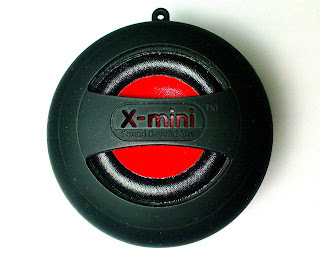 I just bought a second generation X-Mini Capsule Speaker for my MacMini today. I wasn't too happy with the sound output of my Mac Mini so I checked the Internet to see what speakers would go with it. I was intrigued with the X-Mini's promise of "sound beyond size" so I thought of giving it a try. It's good that it's available locally. I was skeptical when I first saw the X-mini. It was too small and I thought that with that size, it wont be able to deliver sound any better than the built-in speakers of my Mac Mini or even those on a laptop. But when the sales clerk tried it on a Macbook, I was pretty surprised by the volume and the vibrant sound that was not at all metallic. It also performs well with my Mini. The sound is loud enough to fill my room while the bass is quite decent considering the size of the speaker. Sound distortion only occurs when volume is set way too high but still, it is not grating. However, the sound produced by the speaker is not stereo but only monoaural. Perhaps this is why the makers of this gadget decided to include a feature called buddy jack. Two or more X-Mini capsules can be interconnected through this jack to make it a chain of speakers, thus extending the sound. The speaker has a short connecting cable that can be neatly folded into the base. It also has a USB connecting cable for charging the internal rechargeable battery and for the sound jack of any device. The manufacturer claims that the speaker coulld run up to 7 hours when used on a portable device like the iPod or a laptop computer. I haven't tried using it for that much time but maybe I would next weekend. I am just a bit worried with the cables because they look a bit flimsy. Hopefully it would withstand the heavy use I subject most of my gadgets to. Overall, I am happy with this X-Mini in terms of the sound it produces. It's size and design are quite impressive too. It even comes with a pouch which makes this tiny wonder a great companion for my portable gadgets.